Heading into summer concert season, Klipsch Music Center in Noblesville has a tough act to follow: itself. The amphitheater sold almost 570,000 tickets to 34 shows last year, the most in recent history, as the live-entertainment industry rebounded from a recession-related slump. Ticket sales at Klipsch were up 60 percent from 2011, when it scheduled about 10 fewer events. The economic downturn forced Live Nation and other concert promoters to rethink their amphitheater shows, said Gary Bongiovanni, editor in chief of trade publication Pollstar, taking a “more conservative and much more realistic” approach to booking. And with events properly packaged and priced, he said, fans responded. Pollstar estimates North American concert venues posted a record $5.1 billion in ticket sales last year, doubling in the past decade despite the downturn. Higher prices are a factor, Bongiovanni said, along with the fact that more top acts are touring. Last year’s ticket sales ranked Klipsch third among its peers, according to Pollstar’s annual list of the top 100 amphitheaters. Only Colorado’s Red Rocks Amphitheatre and DTE Energy Music Theatre in Michigan sold more. Klipsch and other Live Nation venues also have benefited from selling a 10-concert ticket package—the genre-specific “country megaticket”—offering fans a summer of entertainment for a discounted $25 to $100 per show. The package-deal strategy works particularly well with country audiences, Bongiovanni said, since they tend to be drawn to the social experience as much as the music. “It’s a beer-drinking crowd,” he said. Another trend that’s spurring interest: so-called “heritage” acts—the oldies that appeal to middle-age crowds—and co-billing shows to increase their appeal. Journey and the Steve Miller Band play together this month, for example, while Chicago and REO Speedwagon take the stage in August just a couple of weeks before Kiss and Def Leppard team up. Beverly Hills, Calif.-based Live Nation also is looking to music festivals to drive growth, CEO Michael Rapino told analysts last month. Klipsch hosted five of the multi-performer events last summer, and three are on its schedule this year. The Noblesville venue opened in 1989 as Deer Creek Music Center. 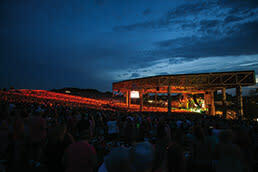 After operating as the Verizon Wireless Music Center from 2001 through 2011, audio manufacturer Klipsch signed a sponsorship agreement rechristening it the Klipsch Music Center. Live Nation, which acquired the 203-acre venue through a series of mergers, put it up for sale in 2006, hoping to capitalize on the rising value of the once-remote property. But it didn’t get any takers. Since 2006, the 24,000-capacity venue has been paying a $1-per-ticket admissions tax to the city of Noblesville to help cover the cost of nearby road construction that improved venue access—and concert-goers’ experience. “It’s a good public-private partnership,” said city attorney Mike Howard. Noblesville issued $67 million in bonds to pay for much-needed road work, extending 146th Street east from Cumberland Road to Interstate 69, for example, and has pledged the admissions tax revenue to repay the debt. The tax, which started at 50 cents per ticket and now stands at $1, is in effect until the bonds are paid off in 2031. Issues like traffic and parking can affect a venue’s long-term success, Pollstar’s Bongiovanni said. Smart promoters continue to invest in their facilities to make the concert-going experience more pleasant. “The more they can make it a friendly environment, where people enjoy going, the better,” he said. With artists collecting most of the ticket proceeds, concert promoters depend on attendees’ spending money on concessions and other extras, Bongiovanni said. Many venues—including Klipsch—have added ancillary activities on event days, such as performances by local bands on other stages, to encourage crowds to show up (and open their wallets) early. Getting fans into the parking lot and through the front gates with minimal hassle is a priority, he said. So is keeping the lines manageable at concession stands and rest rooms. And Klipsch is upgrading its data system with supplemental cell phone coverage to make it easier for fans and staff alike to use technology at the venue. If a guest turns to social media with a gripe during a concert, for example, the event staff does its best to resolve the problem on the spot, Newport said. Although Klipsch kicked off the 2014 season May 17, work was still wrapping up on two new additions: an Americans with Disabilities Act-accessible seating area in the lawn and a new bar offering tables fans can reserve for the evening. Newport expected both to be done in time for the June 7 Tim McGraw show. Located in the amphitheater’s south plaza, the Lone Pine Lounge was built around one of the trees planted when the venue opened 26 years ago. Four-seat tables without a stage view will start at $100, he said. Tables with a stage view will cost more, but the price had not been determined less than a week before its debut. “We’re experimenting with service a little bit,” Newport said. Live Nation also is trying out a smartphone application that offers concert-goers limited opportunities to upgrade their seats or get special access. Newport expects “Experience App” options to range from admission to Klipsch’s Legacy Club (and its air-conditioned rest rooms) to the chance to watch a couple of songs from the venue’s video truck backstage. Down the road, he’s hoping for innovations like real-time rest-room-line monitoring.